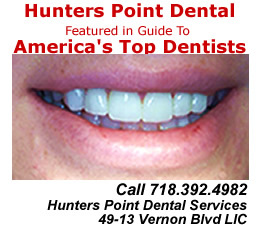 May 1, 2012 / Flushing / Queens Restaurants / Food in Queens / Queens Buzz. 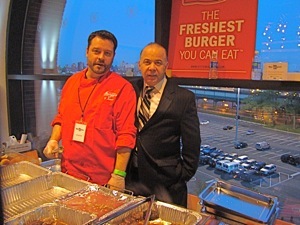 I arrived at Queens Taste 2012 at Caesars on the fifth floor at Citifield about an hour after the event had begun. The feeding frenzy that generally occurs at the very beginning had passed, and most people had found tables and were pleasantly enjoying the fare and light dinner conversation, along with intermittent people-watching [see photo to left]. I started into the food and beverage area surveying the vendors offerings this year and made my first landing at the Borghese Vineyards wine table. I met Ann Marie Borghese, who along with her husband, bought a farm in the 1970’s in Cutchogue, NY, which is located about in the middle of the northern fork of eastern Long Island. I sampled a merlot, which had a mix of cabernet in it. It had less sweetness than in a merlot, an acidic cabernet body and it was surprisingly good. 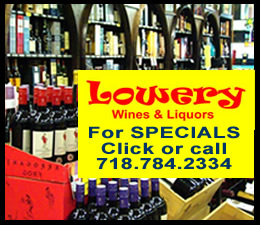 I say surprisingly, because New York wines have ‘been on the come’ for a long time, but never seemed to quite make it. Emboldened by the flavorful first wine, I tried a second … the white chardonnay. This wine was a sweet fruity wine that tasted to me a bit like a Riesling. The hints of oak I might have expected in the chardonnay went undetected, and again I felt like I had stumbled on a nice summer white wine. Ms. Borghese told me her husband was the vintner and it was a labor of love. Ann Marie Borghese is shown [center] in the photo above. 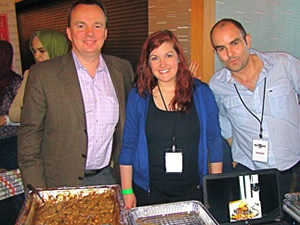 Click here to view our report of Queens Taste 2012 [formerly Taste of the World]. Continued. May 1, 2012 / Flushing / Queens Restaurants / Food in Queens / Queens Buzz. I had a few more minutes to sample the fare before the event winners were to be announced. Uncle Peter’s Restaurant is a mix of Italian, French, Spanish and some Asian. A sort of modern eclectic restaurant that borrows the best from the panoply of cuisines around the world. They were serving a seafood salad, that was sogood, you wanted to revisit this food table several timesover. The salad was made of shrimp, octopus, calamari all cut up into small bite size pieces and mixed with onion, pepper andmango in vinaigrette. Chewy, sweet and sour’ish, and just plain lovely. I met Patty, also one of the owners, who encouraged me to try their dolce de leche mousse. I’m glad I had it second because it was a cream mousse covering part of a crumbled exterior of an oreo cookie. Something for the old sweet tooth. 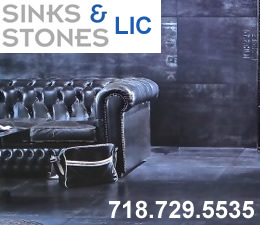 Uncle Peter’s is located near 83rd Street along Northern Blvd in Jackson Heights. 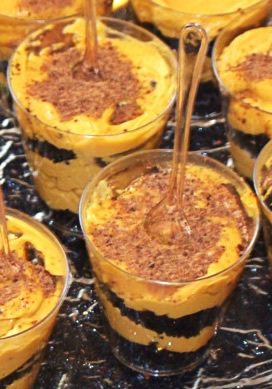 Patty is shown in the photo above right and the dolce de leche mousse is shown above left. I made my way down to the Dog and the Duck Restaurant of Sunnyside. This is a 21st century Irish American restaurant that was offering a dish they called ‘Duck Confit’. It was duck cooked in fat and served with parsley, atop a dash of mashed potato, inside of breaded bottom and covered in a wild mushroom sauce. Duck is normally a fairly lean dry meat and this wasn’t. It tasted like a tender, flavorful shredded beef and the potato and the pastry bottom balanced out the dish. 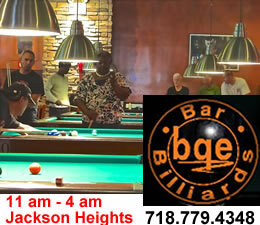 The Dog & Duck is located in the mid 40’s along Skillman Avenue in Sunnyside. 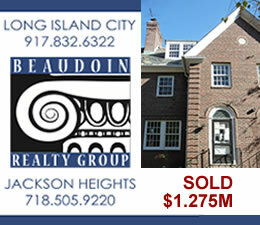 In the photo to your right are James Dolan [left] and Padraigh Connolly [right], aka the owners. Liz Parsekian was serving Kombucha tea nearby and I decided to give this heretofore, unheard of, slightly alcoholic beverage a try. They offer familiar flavors like vanilla and not-so-familiar flavors like Yerba Mate. I sampled both flavors and they tasted like a mix of tea and wine cooler. The tea leaves come from all over the world, depending on the flavor, and then there’s a light sweetness to it and almost a hint of carbonation that’s the alcohol. At 1.5% you’d have to drink four or five to get the equivalent of a bottle of beer. 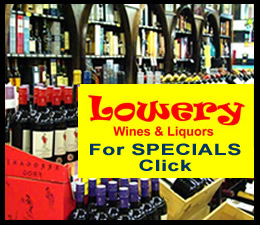 These are priced at $3.99 a bottle. 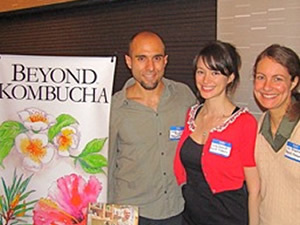 Spiro Theofilatos is the creator / vintner / brewer of the kombucha and he produces gallons each day, which is sold to local stores like Food Cellar & Co in LIC and restaurants like Queens Kickshaw in Astoria. Kombucha is located on Steinway Street south of Broadway in Astoria. Spiro Theofilatos [left] and Liz Parsekian [right] are shown in the photo above. 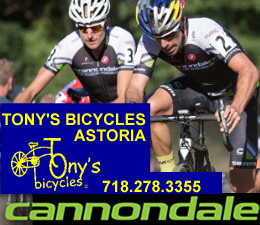 A number of the vendors had got their start and continue to work out of the Entrepreneur Space in Long Island City. 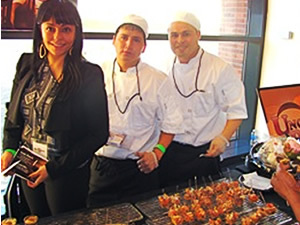 Creative Concepts is one such caterer that got its start about three years ago. I sampled the only remaining offering they had left. It was an appetizer containing bits of shrimp, melted Monterey jack cheese, tomato sauce, scallions and a nice little kick compliments of a jalapeno chipotle mayonnaise on a thin cut of panini or a crepe. It was a tender little appetizer that slid down easily, so I treated myself to more than one. Creative Concepts got its start three years ago and is now employing 12 full time people and works with a cadre of temps, continuing to operate out of the Entrepreneur Space as their primary kitchen. It was started by a trio, Julie Sommers [see sister in photo], Miguel Urrego [not pictured] and Benjamin Lester [also in photo]. 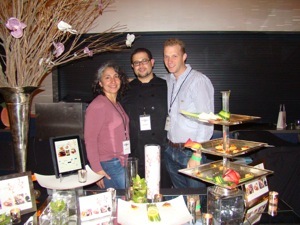 The third person [right] in the photo is Creative Concept’s sous chef. I sampled a sparkling wine from France that was organic and flavorful and well worth the $20 - $25 I was informed was the retail asking price for a bottle. 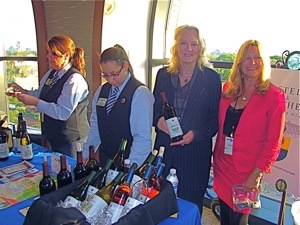 In the photo you can see the distributor [center] along with a couple of the people who did the pouring. Burgers and Belgian Fries is the name of a restaurant that opened in January of 2012. 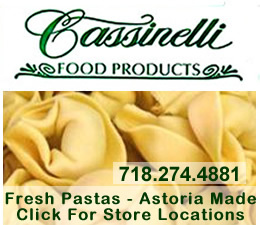 It’s located on Woodside Avenue in Woodside across from the Ottomanelli Butcher shop, so you know they get their meat fresh daily. I had a jalapeno burger which was very juicy with a bit of ground jalapeno put into the ground beef to spice it up a bit. The Burgers and Belgian Fries offers a variety of beef burgers and fries, and based on what we’ve seen and tasted, it’s likely to be a big hit. In the photo above right is Frank Ottomanelli [left]. Papazzio’s Italian restaurant in Bayside was the winner of the best appetizer with their pasta e fagioli soup. When I arrived at their table I was served a small bowl of it. I savored the red and white beans spread throughout the creamy broth containing prosciutto mixed with onion, carrots, celery and rosemary with cut noodles. It had a slightly sweet comfort food flavor without the calories. Papazzio restaurant is located on Bell Blvd in Bayside. 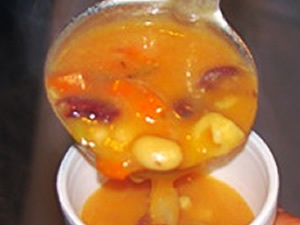 In the photo to your left is a snapshot of Papazzio's Pasta e Fagioli soup being served at Taste of the World 2012 in Flushing Queens. Bon Fete Baking and You Cake have not only founded new businesses at the Entrepreneur Space, but also seem to have found friends. The two entrepreneurial companies were working a table with complementary baking goods. YouCake create fun, joyful party ensembles that contain vivid icons, edible papers [corn starch and sugar] atop baked goods for all occasions. While Bon Fete offered a number of health bars comprised of flavorful mixes of fruits like mangoes, bananas and dates and walnuts mixed in a sweet bread / bar textured cake. You can see both offerings in the photo to above left. In the photo above right are Ike A. de Guzman of Bonne Fete Baking [center left & center right] and Carolyn Sevos Hamilton of YouCake. I got the impression that the Entrepreneur Space in LIC has been pretty busy these days. Yolanda’s Pesto Sauces were another product coming out of the QEDC incubator kitchen. Yolanda makes four unique pesto sauces which to date she sells online as well as at Roosevelt Mall out on Long Island. She tries uses mostly all natural ingredients, many of which are purchased from local vendors, and she’s looking for a food retailer in Queens. The sauce comes in a 16 oz bottle [I’m guessing] and retails for about $10. All of the pesto sauces include a base made with parmesan, garlic, extra virgin olive oil, sea salt and black pepper. 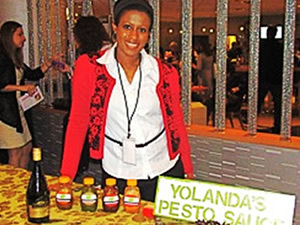 Yolanda is shown with her pesto sauces at Taste of the World 2012 in Flushing Queens. I sampled the four flavors she had at the table on a small piece of bread. They included a bell red pepper, which is barbequed, and is sweet with a slight hint of smoky flavor. The sun dried tomato pesto sauce has a rich tomato flavor, which is offset by the addition of ground almonds. Her classic flavor is made with almonds in lieu of pine nuts, to which she adds a generous portion of basil leaves which really come through in the flavoring. And she hit me with her Cajun pepper which has a bit of kick to it and includes basil, thyme, paprika and red peppers. Magna had won best entrée. From what I was told, the judges had difficulty deciding which of their two entrees to give first place. As it was late and time to pack up, I didn’t get to sample their Penne alla Siciliana, nor their Pollo alla Romana, but the judges said they were good. Magna is located in the Marco Hotel along Northern Blvd not far from Main Street in Flushing. 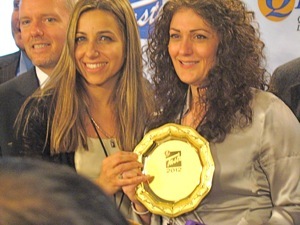 The two women shown holding the Magna award are Letizia Barbetta and Eleonora Greco. As the saying goes, “last but not least”. And so it was as I struck up a conversation with Blanca Lilla Narvaez who is the creator of Tropisec products. 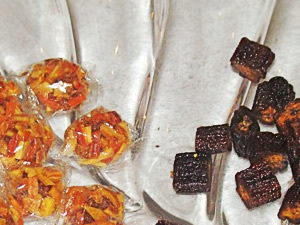 She creates all natural candies made of dehydrated fruit. You really have to taste these to believe them. I’m not sure what she’s named them, but I had a chocolate covered dried banana, that had an al dente texture and a rich banana flavor. And an explosively tart and sweet ball of dried fruits made with pineapple, apple, mango and papaya. In the photo to your left are the dehydrated all natural fruit candies and the chocolate bananas. The process she uses to create these treats is a bit of a mystery, but it goes something along these lines. First you age the fruit to a certain point. Then you place them on these solar panels and dry / dehydrate them naturally – taking great care to remove them at the exact right time or it doesn’t work. And they have to be prepped and cut a certain way to get the end product, which is really unbelieveable. She also uses packaging, made from banana trees and other natural plants in Columbia, by an artisanal women's group - some of whom have been displaced by violence. So unbelievable that Williams & Sonoma has picked her up to do artesanal in-store promotions starting this spring beginning in their Columbus Circle store. You can also buy the dried / dehydrated fruit candies online at www.impressariaconcierge.com. and then click products and dried fruits. A small sweet dried fruit ball cost about $1. 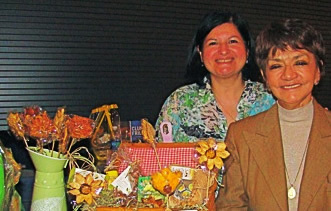 In the photo above right is Blanca Lilla Narvaez of Tropisec Products and Alicia Salvio of 24/7 Impressaria, LLC - the company which markets and sells the Tropisec products online. The Queens Taste 2012 judges are shown in the photo to your right. 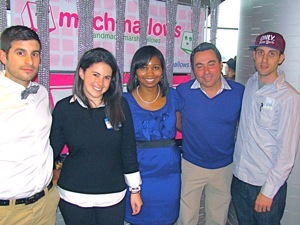 They are [from left to right] Julian Lesser of Boro Mag, Amanda Sidman of the Daily News, Veronica Levin of the Queens Tribune, Rocco Vertuccio of NY1 and Jeffrey Orlick of I Want More Food Walking Tours. 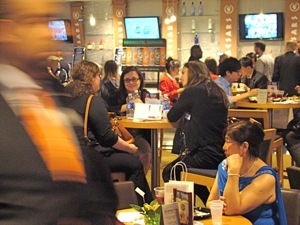 There were between 800 and 1,000 people in attendance at the Taste of Queens 2012 event, and between 60 and 90 food and beverage vendors. 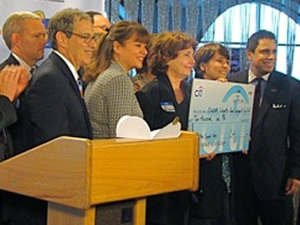 The QEDC and Citibank also gave three cash awards to entrepreneurs who won in: 1) a food-based business [Itizi Gourmet Food Truck – all natural ice cream & sorbet], 2) innovative business [Addicks Enterprises – purse organizer] and social enterprise [Better Speech Now – foreign language accent reduction]. From left to right City Councilmember Jimmy Van Bramer, QEDC Executive Director Seth Bornstein, and the three award winners Itzi Gourmet, Addicks Enterprises and Better Speech Now.